Here you can configure in wich way Geolocalise will use the add entry data and the appearance of Geolocalise in SOBI Add Entry Form. Open your site in backend, and select the menu Components > Sobi2. Once in the component Sobi2, go to the left side menu and choose Plugins > Plugin Manager and choose Geolocalise. Go to Parameters tab and find "Frontend configuration" line. Set display mode for the Google Map in SOBI Add Entry form: "Info map", "pickable and draggable map" or "no map" are possible. The plugin are capable to search about coordinates in images of SOBI Gallery Plugin. This option will be active during the add entry process, the user simpley use "Search coordinates on images" button. To allow this function, it's necessary to make a little modification to the Gallery plugin. This because the Gallery plugin lose the geodata from the images.Follow the help tab of the plugin. The zip package of our plugin Geolocalise contains the actual version of the Gallery Plugin (modified), and a sample geo taged image. (1) (2) Upload own pictures your own image or use the a sample geo taged image from your default Geolocalise Zip package. (4) If the GPS coordinates was found it the Geolocalise preview map will show. 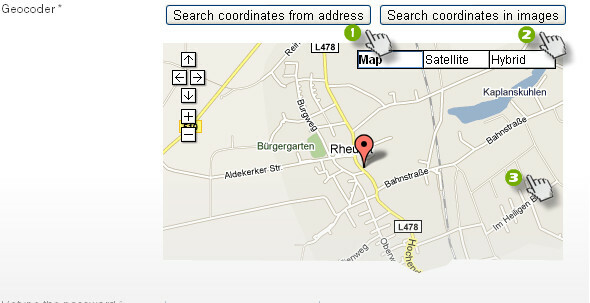 Click on the map to select coordinates. (1) "Search coordinates from address" : After the address fields are filled if the user use this buttons, the Google coordinates wil be extract automaticaly using the postal address. 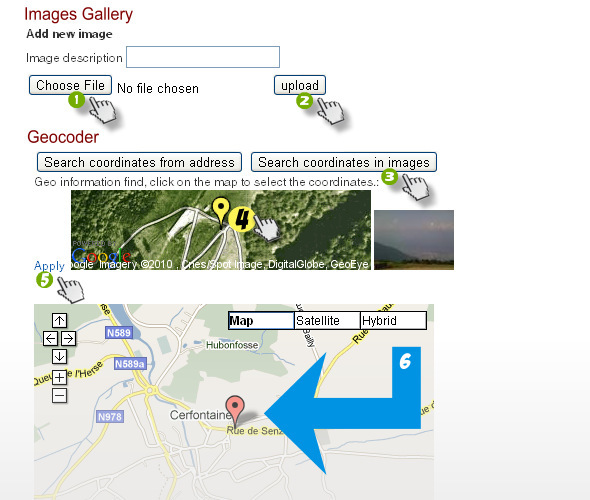 (2) "Search coordinates in images" : This function will search about coordinates in images of SOBI Gallery Plugin as was shown in "3.2 Get position on the map using an image" of this tutorial. Here you can set the plugin position in SOBI2 add entry form. For that simply enter the order number for plugin. Allow to geocode the entries automaticaly durring the save proccess. Allow to geocode the entries automaticaly durring the update proccess.